Greek Council President: MU Greek Council! We sponsor the annual Scare Games. Mike Wazowski: [takes a flyer] The Scare What now? Greek Council VP: [pounds his fist against the table] The Scare Games! A super intense scaring competition! Greek Council President: They're *dangerous*, anything could happen. Greek Council VP: A bunch of guys ended up going to hospital last year. Greek Council President: You could totally *die*. Mike Wazowski: [whilst staring at the flyer] Cool. Q: How come Kelsey Grammer was once rumored to be the voice of Mr. Waternoose in the film? Q: If Sulley is the main character, how come Billy Crystal's name is credited first? Q: If adult screams can yield so much energy, why does Monsters, Inc. not try to harvest screams from adults during an energy crisis? 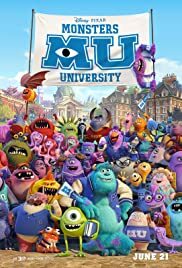 When Mike Wazowski is young, he visits the Monsters University in a tour of his primary school. A senior student gives his hat to Mike and he plans to become a scary monster. Years later, Mike joins the Monsters University and on the arrival, he receives a flier of the Scare Games that will take place soon in the campus. Mike also befriends his roommate Randall. When the lazy student James P. "Sully" Sullivan, who belongs to a family of famous "scarers", breaks in his room, they start a competition in class. Their dispute ends when they accidentally break the pride and of joy of Dean Abigail Hardscrabble, a cylinder with her greatest achievement – a powerful scream of a boy. 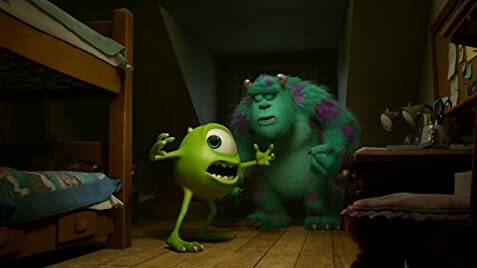 They both are expelled from the scare classes by Hardscrambble that tells that Sully is lazy and Mike is not scary, and they become enemies. "Monsters University" is a pleasant story of friendship and a prequel of "Monsters Inc.". The plot is based on the American college life and despite the lack of any identification with my country, with fraternities and silly parties of American college students, the plot is funny and entertaining. My vote is eight.